The lunar new year is being celebrated today in our part of the world but it is also Valentine's Day for most of the world. It's a double red day because the color is associated with love on this day of hearts and at the same time, the Chinese believe that having something red at the start of the new year brings luck for the rest of it. Many of us mistake Kung Hei Fat Choy as Chinese for "Happy New Year" but a friend who studied in Taiwan told me that it is actually a wish for someone to be prosperous in the new year. Hopefully we would be prosperous this year, the year of the Tiger in Chinese Astrology. 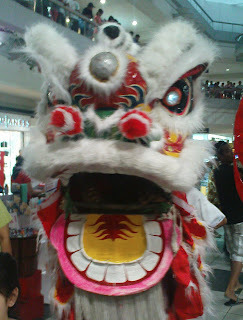 When I passed by the SM North mall this morning, there were dragon and lion dances. The main building was filled with the sounds of drums, gongs and cymbals as the dancers prance around. I even sniffed around to check if any incense was burning. A Chinese friend once told me that lion dances are performed on special days for good luck, health, prosperity and blessings. To make the lion even more powerful a ceremony is performed wherein a dot is placed on the lion to make it come to life. 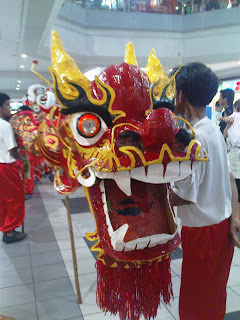 I used to interchange the lion dance for the dragon dance (and vice versa) because of their appearances. This morning, I found out that the lion has only two dancers hidden behind the mask while the dragon has several people, more than ten men if I am not mistaken. Anyway, I still had to go to my father's place for our usual Sunday lunch so I wasn't able to see the entire lion and dragon dances. On my way out of the mall, I met the strangest thing ever. There were these two guys dressed as mascots but instead of cute characters, they were dressed up as huge television sets and written across the screen was "Something Big Will Happen to Philippine Television". Their costumes were actually the body/case of big screen CRT TVs that were the hit during the end part of the 90s. I went back to Bulacan after having lunch at my father's place and I got there in time to see my friends leaving for a branch of the SM Mall in Baliuag. Since it was still early, I decided to go with them and since it was a Sunday, there was very light traffic going there. It was a different inside the mall though. It was full of people, young and old. I even saw a newborn baby there carried by his doting father. All the restaurants were full and with waiting lines to boot. We decided to go around the mall and checked our favorite shops. We went to the electronics and I.T. sections since I am in the look out for a dual SIM phone. At present, I carry three phones everyday and a dual SIM phone would leave me with just two phones to lug daily. I am looking at this locally branded units called the MyPhone. It meets my first requirement (2 SIMs in one) and it is also a QWERTY phone. Aside from these, the price is very low compared to other brands! However, it doesn't have Wi-Fi capability which I don't have a need for at the moment because I already have a BlackBerry and a netbook. We passed by the CD-R King store and got some DVD-Rs as well as a mouse for my netbook. From here we went to Joey Pepperoni, a pizzeria and pasta eatery. The place was also filled with people but we immediately seated and attended to by a smiling crew member. We ordered for Pesto Pasta, Joey's Pepperoni pizza, and bottomless iced tea. The iced tea was immediately served and my friend consumed the contents of his glass in one instant. It was promptly filled by the servers. We didn't have to wait really long for the pasta to be served. The serving was very generous, luckily we ordered for just one because it was more than enough for us. 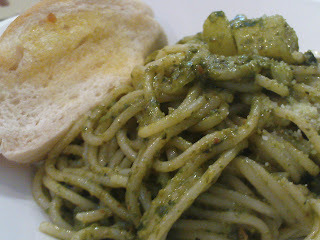 It has a lot of pesto sauce but the taste was not too over powering. In fact, it was what I expected of a pesto pasta. My friend found it strange though that the dish has potatoes and beans in it. I told him that maybe it was to emphasize that it's a healthy snack and a vegetarian dish because it did not have any meat in it. The pasta they used though was not good, it was like it was over-cooked and a little on the soggy side instead of being firm. The pizza was fantastic. 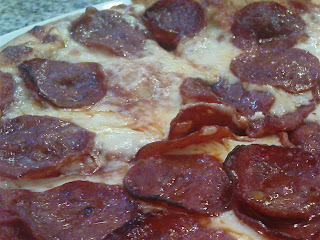 It was almost covered entirely by pepperoni slices and the cheese was overflowing. I like the crust since it is crunchy and soft at the same time. I thought the sauce was a bit salty though although my friend said it was just alright. I also tasted a little sweetness perhaps to meet the taste preference of some Filipinos. But if it is sweetness they wanted, then Filipinos should get a load of the Sunkist Iced Tea served by this joint. It was too sweet for my taste. I even asked for some extra ice to dilute the solution further because it was so sweet. Overall, I enjoyed the meal at Joey Pepperonis. Aside from the good food, the service crew was also very attentive and fast in giving what their customers needed. We left the mall before sundown and more people were still coming in. Many were couples who must be celebrating Valentine's Day in the mall. Perhaps the other people were just trying to escape the heat of the afternoon. Whatever their reasons, we all made the owners of the mall prosperous this start of the year of the Tiger. Kung Hei Fat Choy indeed and have a romantic Valentine's Day too.